The Joker does some crazy stuff. Of course, most of it is against the law, which puts him at odds with Batman most of the time. Maybe ol' Bats just doesn't understand that The Joker is just joking around! After all, the guy wears a bright purple suit and has green hair. Also, he wears this HaHaHa Necktie and that's sort of a signal to the world of a person who doesn't take things too seriously. Actually, are you the type that enjoys a good joke? Do you have a better sense of humor than Batman? 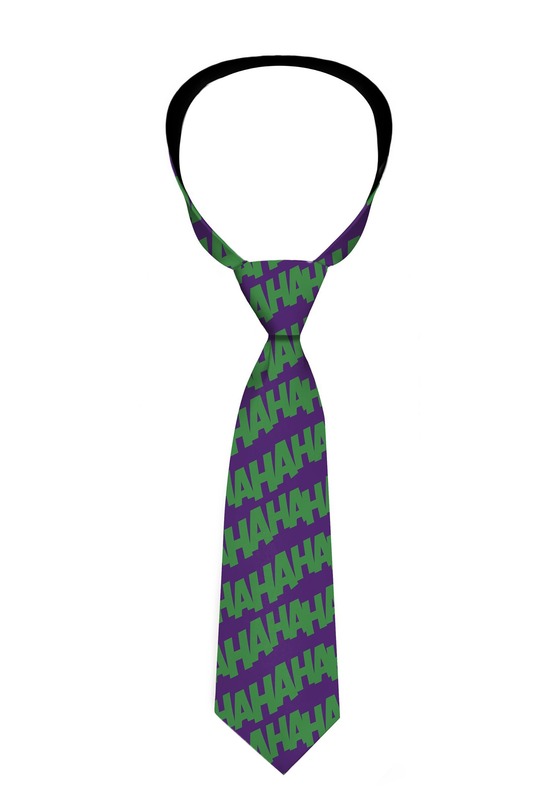 Then maybe this Joker Necktie is right for you, too! This officially licensed Joker HaHaHa Necktie gives you the very unserious style of the DC supervillain. It's a deep purple color with a repeating green "HaHaHa" pattern on it. It adds a splash of color to your style and it even lets Batman know that you're a real Joker-type. We can't recommend wearing this Joker Necktie while visiting Gotham City, but it is a pretty good way to spice up your ordinary wardrobe. It even works great as that finishing touch to add to your Joker cosplay outfit!